Choreography is already a participatory art, both in its process and in its performance, so when Lola Maury — Visiting Alumni Artist at the Royal Central School of Speech and Drama choreographing for their Brink Festival — adds participatory game concepts into the choreographic mix of Two to Tune, it is the game that gives the work its unique character. Rather than a linear narrative the work consists of a succession of gestural images, improvisational in quality, that form a physical dialogue between the two players, James Morgan and Laureline Richard. It is a game in which mutual understanding and acceptance rather than winning are the goals, which gives the ludic nature of the work both a physical and a spiritual aspect. In this I am reminded of Charlie Chaplin’s description of a dancer as a cross between a nun and a boxer, though Richard in particular has the lean muscularity of a long distance runner. Costume designer Clare McGarrigle concurs, giving the players shorts and singlets that speak of both sport and of stylish comfort. 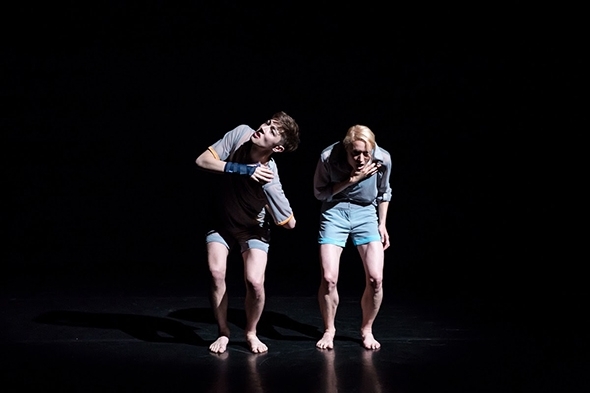 Two to Tune is a small-scale work with abundant energy and a pared-down aesthetic that needs the intimacy of a pared-down theatre for us to read the expressions and catch the details. With the limited rig in the Webber Douglas Studio lighting designer Agostina Califano has sculpted a perfectly scaled underground tryst where Morgan and Richard spar. The game is divided into seamless acts, starting with a prelude in stillness as the two stand side by side looking out at the audience with a gesture of hand over heart as if listening to an invisible umpire reading them the rules. The score by Alberto Ruiz shrouds the freeze-frame actions that follow in neutral sound but as the game develops he incorporates the voices of Igor Urzelai, Moreno Solinas and Eleanor Sikorski into a choir that sounds as if it was — convincingly for the setting — recorded under a bridge at night. It provides a vault of sound in which attention can focus on the interaction of the two players and their gestural references to wrestling, swordplay, boxing, dueling and perhaps to arcane arts. The way Richard articulates her gestures gives them the appearance of a spell that Morgan deftly parries, but the way she comments on her gestures with her expressive face gives her the upper hand, whether curling her lip in distaste or transforming a biking gesture into a narrative of tough individuality. Morgan is more neutral in his use of facial gestures but his endurance keeps Richard on her toes as she finds ways to wear him down, reducing him at one point to a pummeled, willowy adversary to her boxing. The nature of the game is unclear until the very end; we are left to deduce the rules and the goal from the actions of the players. In this way, Two to Tune relates as much to the tuning of Morgan and Richard as to the tuning of the audience into the nature of their contest. They appear to be stalking each other in a game of strategy, less on the level of a board game (though they make carefully considered moves and react to the moves of the other) as on the physical gestural game of scissor/paper/rock but there is also an ominous, intangible subtext that the brooding score captures. Gestures develop in intensity and complexity, sometimes resting in mid expression then continuing as if in the process of declaiming a speech or waving an arm in defiance. Between Morgan and Richard there is also a sensual, sometimes tender, element to the game, an unspoken attraction and repulsion as they strive to enter the each other’s comfort zone. The speed and space of their moves increases until they are running to the rolling, pounding drumming in the score; they come close to colliding but one of the rules of the game appears to be they cannot touch even in close proximity at high speed. It makes for an exciting dynamic as they constantly test each other, learn about each other and tune in to each other. The way the game resolves, quite suddenly, as they come together in partnership is quite magical, suggesting everything that has happened in the prior 35 minutes has been working towards this moment: the accord of two instruments. It is also a resolution for the audience: we share in the harmony and are reminded of the origins of gesture and dance.